Happy Cinco de Mayo with some tasty Pico de Gallo!! This is a little recipe I use that is simple. It’s a cross between Pico de Gallo and salsa. Really, just a chunky salsa that provides a good base for guacamole. Basically, find all the tomatoes, onions, red peppers, yellow peppers, orange peppers and jalapeno peppers (seeded) that you have in your home at this moment and chop them up. Combine with spices from a taco seasoning pack because figuring out how much of each spice is just too complicated. 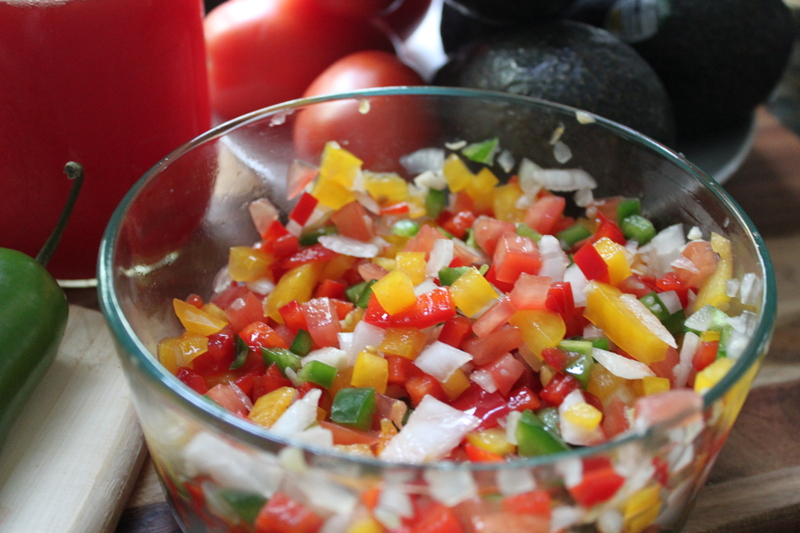 If you want to make it more salsa–y just pulse a few times in a food processor and use maybe add more tomatoes. If you want to make guacamole, substitute the bell peppers with avocado and mush it all up. Take a lime (you are having margaritas so you know there will be limes) and squeeze lime juice all over it. Now if you like Cilantro, add it to any and all of the above. I am allergic to cilantro so I omit it. Keep it simple. Remember, you are preparing while making AND drinking margaritas. Seriously, it is that simple. I think when people post recipes we get too caught up in having exactly what the recipe calls for. Unless you are baking, recipes are more a suggestion than a written in stone. What you have is all you need.